The Storey family had been machine tool makers in South London for several years and formed the Storey Machine Tool Co., Ltd in 1916. 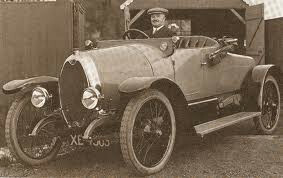 William Storey was a car enthusiast and before World War I was over he experimented with prototypes using engines from Coventry Simplex and Wisconsin, as well as a rotary unit. In 1919 he bought a 40-acre site at Tonbridge, and the following year went into production. Bodies were built in the London factory where chassis assembly also took place until the Tonbridge works was ready. Storey's own 1496cc engine was ready by the end of 1920, but Storey's company was bankrupt by the end of the year. He claimed to have made 1000 cars in the 12 months that he had been in business, but this seems a very high figure. Will's brother Jack then came onto the scene. He had planned to make a car called the Winchester in partnership with Ernest Vernon Varley Grosssmith, but this had come to nothing. He retained the characteristic oval radiator but obtained engines from wherever he could. At least one Storey had a 6-cylinder Buick engine and others used various sizes of Meadows units. The business supplied spares for a while, then became a garage, moving to Norbury in South London. Will Storey returned to the machine tool business.